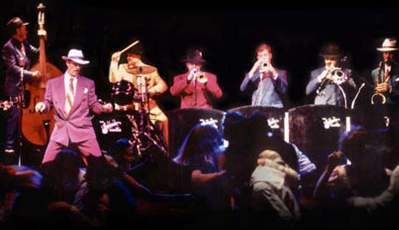 The Swing Kings are a highly versatile dance band featuring an extensive play list. They easily transition from rockin’ swing to the finesse of a traditional 40’s big band or venture deep into Sinatra-land with lush ballads and famous swingin’ arrangements. This band is also well versed in contemporary dance music, Latin, R & B, Disco, Rock and Funk. The Sing Kings love for all music brings these accomplished musicians together to create an exciting and diverse show. Their reputation for energetic and visually appealing entertainment stands as a testament to these fine artists. From casino showrooms, galas, award shows, corporate events, private parties and West Coast concerts and nightclubs, The Swing Kings guarantee to stir the romantic heat and move your dancin’ feet.